The event took place on the McHenry Library lawn. Claudia and Alec Webster with Chancellor Blumenthal. 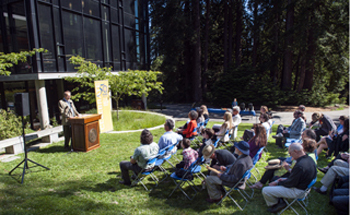 The gift will provide permanent support to the University Librarian for the purpose of archive oversight and maintenance in the UC Santa Cruz Libraries. 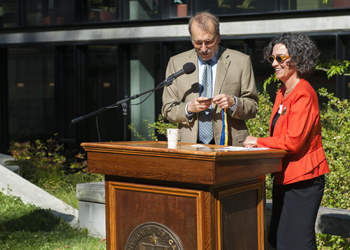 Elizabeth Cowell, who was named University Librarian last July, was honored as the inaugural appointee to the Presidential Chair at a formal investiture ceremony that took place yesterday on the McHenry Library lawn. "It is with gratitude that I acknowledge the Webster Family Foundation's recognition of the central role that the University Library plays in the intellectual life of the campus at UC Santa Cruz,” said Cowell. “I am honored to be the first beneficiary of the Richard L. Press University Librarian Presidential Chair endowment." Increasing support for the Library and endowed chairs are goals of the Campaign for UC Santa Cruz, which to date has raised more than $200 million in resources for the campus. 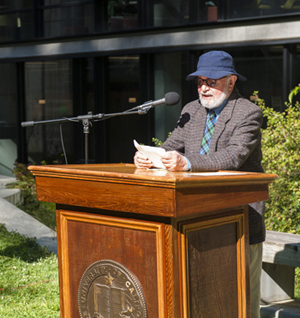 The new Presidential Chair recognizes and celebrates Richard Press (father of Daniel Press, professor of environmental studies and executive director of the Center for Agrocecology and Sustainable Food Systems at UC Santa Cruz) and his many decades of contributions to academic libraries and book collecting. Richard Press’s work ranges from building library collections on 19th century social movements and revolutions, to his role as one of the great American dealers of fine and scholarly books on the arts, architecture, and Judaica. A great champion, not only of libraries, but also of librarians, Press has nurtured the careers of many staff at private and public universities alike, and also educated and inspired scores of collectors. 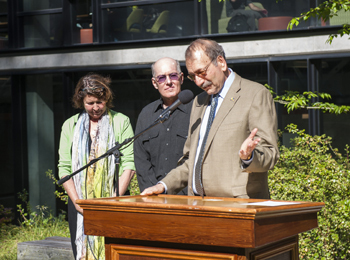 The Webster Family has had an exceptional impact on the UC Santa Cruz campus, providing gifts to benefit several areas including the Natural Reserves, the Center for Agroecology and Sustainable Food Systems, and the Libraries. Alec Webster (’02, College Eight) came to UC Santa Cruz in 1987 after attending UC Santa Barbara. He worked for the Santa Cruz Institute of Particle Physics as a machinist and lab technician. That experience transformed him into a serious student with a deep interest in food production, forestry, and social justice issues, which led to a B.A. in environmental studies from UC Santa Cruz, with highest honors. Alec and his wife Claudia (UC Santa Barbara, ’75, Art) currently serve on the Social Sciences Dean’s Board of Councilors, and Alec is a UC Santa Cruz Foundation trustee. He is co-president and secretary of the Helen and Will Webster Foundation, which is dedicated to public education and well-being. Alec has also served on the South Campus Vision Council, which ignited his passion for the campus historic district and led to the Helen and Will Webster Foundation providing a gift for renovation and programming for the Cowell Hay Barn at UC Santa Cruz. The Campaign for UC Santa Cruz supports excellence across the university through increased private investment in the people and ideas shaping the future. It is bringing critical new resources to the University Library, each academic division, and to signature initiatives in the student experience, genomics, coastal sustainability, data science, and the intersection of the arts and sciences.